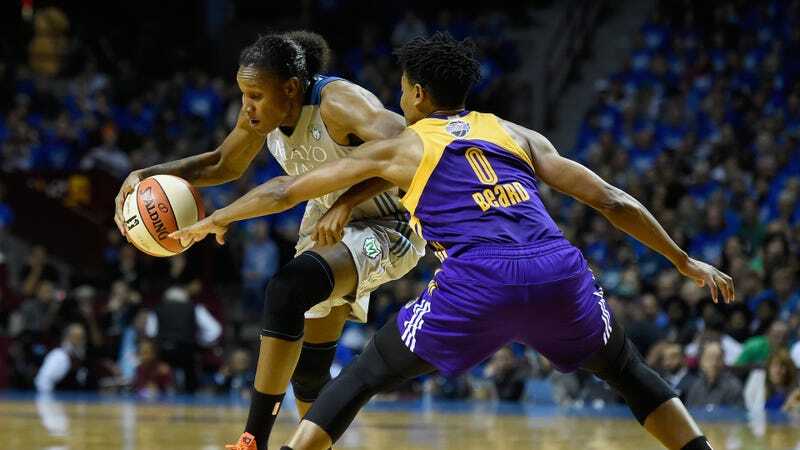 The Minnesota Lynx staved off a second-half comeback by the Los Angeles Sparks in tonight’s Game 2 of the WNBA Finals—with the Sparks squandering two key opportunities in a wild and messy final minute before losing, 70-68, to even the series at one game apiece. The Lynx leapt out to an 18-point lead by the end of the first quarter and pushed the score to 45-26 by halftime, with a starring effort by Sylvia Fowles, who ended the night with a WNBA Finals-record 17 rebounds. But the Sparks started clawing their way back in the second half, limiting Minnesota to 15 points in the third quarter, and they cut the deficit to just two points after Candace Parker made a pair of free throws with 33 seconds remaining. After Maya Moore missed a jumper for the Lynx, the Sparks got the ball back with 13 seconds to go in a one-possession game—but the Minnesota defense stymied Alana Beard on the inbound attempt, and she was called for a five-second violation. This year’s finals are so far following the same path as last year’s, with Los Angeles taking Game 1 and Minnesota Game 2. Last year, Game 3 went to the Sparks; this year, Game 3 is Friday.